Hey Ya’ll! 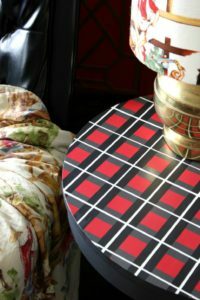 I am back with 29 of my all time favorite thrift store furniture makeovers! I am super excited to share some of my favorite finishes with you and hopefully they make you as inspired as I am. These ladies have some serious talent! Be sure to go check them all out for even more inspiration. But please don’t get angry with me when you get sucked down the rabbit hole…ha-ha. I could look at some of these ladies work for hours. Sheesh! Anyway…you are here to see the fabulous finishes…so what are we waiting for? Let’s get going! Now I can’t possibly rank these so they are in no particular order, just jotted ’em down and started rolling, so without further ado! 1. 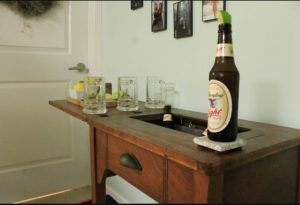 Our first makeover comes from Michelle with A Crafty Mix. This is probably the most creative finish I have ever seen! 2. 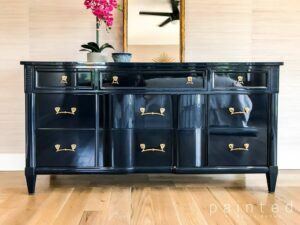 Next up on the line up is this glossy glorious makeover from Painted by Kayla Payne. Almost makes you whistle don’t it? 3. 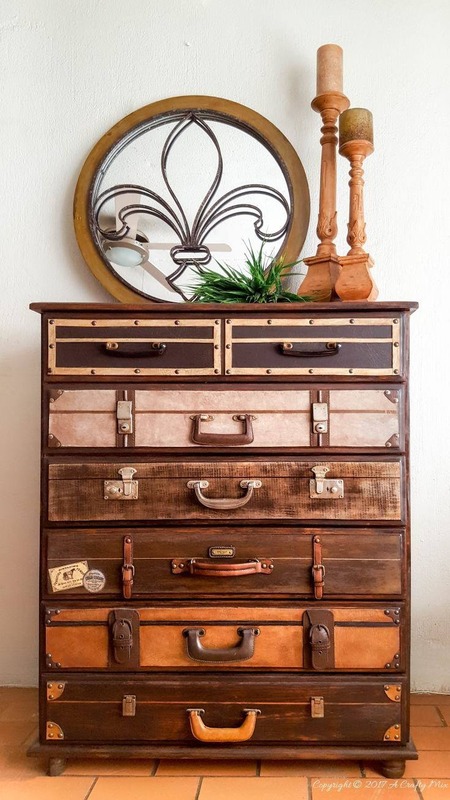 Kandice over at Just the Woods teaches you how to create a great stencil finish using these great Cutting Edge Stencils on furniture! I just used this idea on a desk not long ago! 4. 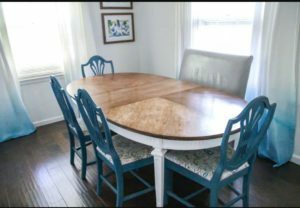 This worn out dining room table got made over right by Carrie with Lovely Etc. I really love how she contrasted the chairs and table! 5. Carrie is right back from Lovely Etc. with this awesome idea for a herringbone table-top using paint sticks!! This gal is seriously creative! 6. Who doesn’t love a French Provincial Vanity? 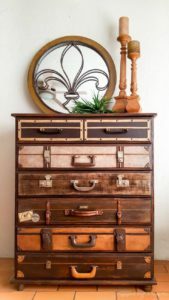 Well you will really love what Serena with Thrift Diving did with this one! I sure do! 7. Okay, so this is actually a room makeover, but it made my list because it is so light and bright…and she did make over the table. Tamara at citrineliving knows how to really let the sunshine in! 8. Our next artist in the line up is Melissa from Create and Find, and she made this little antique side table light and bright and dang near new with a little paint! 9. Now ya’ll know I love me a good decoupage project! Jessica over at Petal and Ply definitely did this one right! I’m in love! 10. 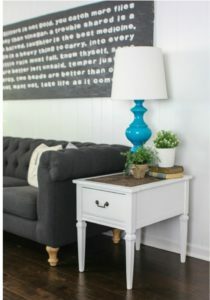 The creator at Love My Simple Home, Julie, is my next fave! 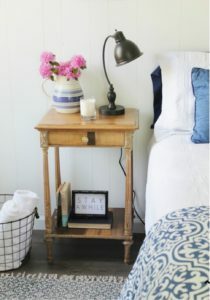 I love a natural wood finish, and she knocked it out of the park with this little night table. 11. 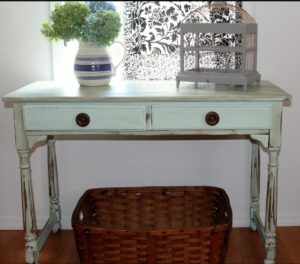 Julie is right back again from Love My Simple Home with this beautifully painted and distressed desk. There is simply nothing else to say other than mmmmmmm…. 12. Now this next gal is really one of my number one inspirations! 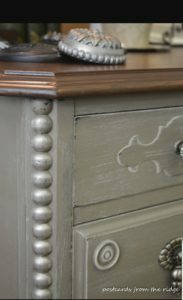 Thea with That Sweet Tea Life has the most fantastic makeovers and she didn’t disappoint with this “Rustic Glam” finish on this nightstand! 13. And you know my number one inspiration gets and encore! 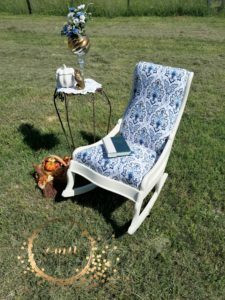 That Sweet Tea Life is right back showing you how to spray a fabulous finish on your furniture! 14. Yassss!! Is it called a tricore???? 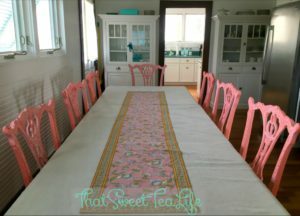 That Sweet Tea Life is back one more time….yes I love her that much…showing you how an applique can change your whole makeover! 15. Carrie from Thirty Eighth Street is easily one of my favorites! She always has great tips and tricks…and her finishes aren’t half bad either!! 17. 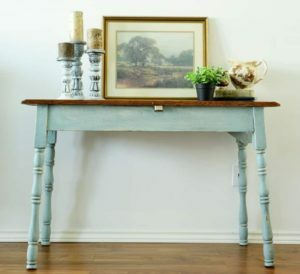 Sunshine and Munchkins creator Shani did not disappoint with this adorable hallway table makeover! 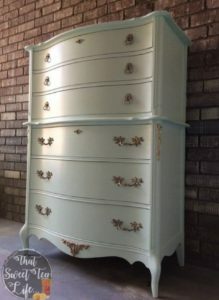 I love the softness of this piece….yummy! 18. Yep ya’ll, time for another two-fer! 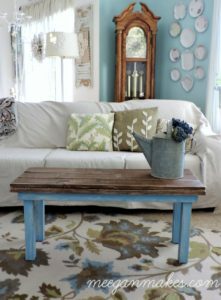 First, Meegan from Meegan Makes brings us a farmhouse coffee table makeover. Is there anything better than farmhouse? 19. 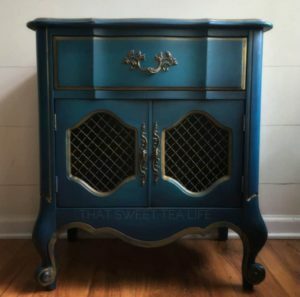 Also from Meegan Makes, we have this gloriously scrumptious stereo cabinet makeover! Ah-Maze-Ing!!! 20. Whew! Ya’ll keeping up! 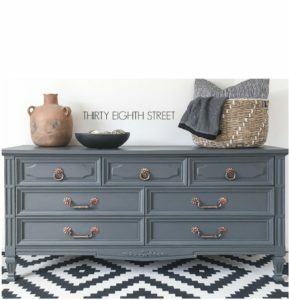 Here comes another one….how about another fabulous farmhouse makeover? 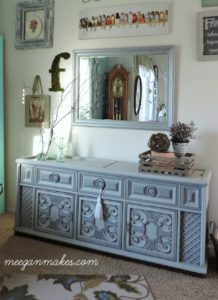 This one from Rita over at Harbour Breeze Home is done just right, letting all the details and character shine through! 21. 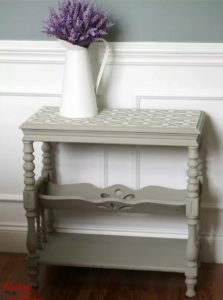 How about another stenciled finish? 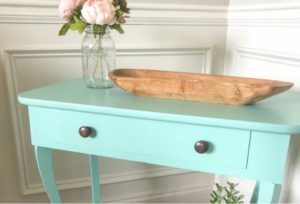 Stephanie with Gathered In the Kitchen does a really cool finish with chalk paint! 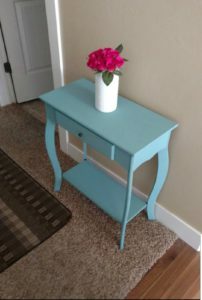 I love chalk paint!! 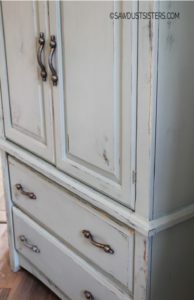 I really LOVE Dixie Belle Chalk Paint!!! 22. And Gathered In the Kitchen is right back with a fantabulous (so great I made my own word!) 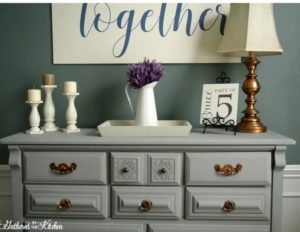 makeover on this dresser. 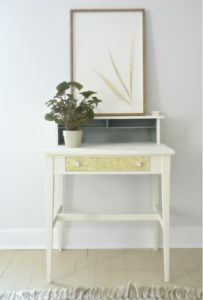 I love Dropcloth from Dixie Belle Paint Company! It’s a staple in my workshop for sure! 23. Janice with Sawdust Sisters is another one I love to feature. 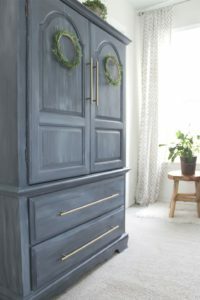 She never misses, and she really hit a home run with this milk paint makeover on this armoire! It’s breathtakingly beautiful! 24. 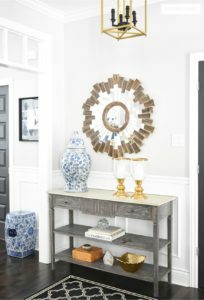 Okay guys, hang in there, we are almost there….but you don’t want to miss this The Honeycomb Home and Roxanne’s elegant makeover on her armoire! I love that stippled effect! And those bars!!! 25. 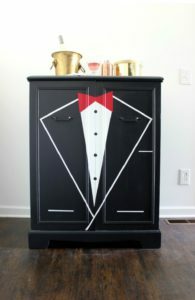 Jenna with Rain on a Tin Roof brings us a really fun makeover that I just couldn’t resist including in my favorites with her tuxedo bar! (smiley face here…because it just makes me happy). 26. And one more from Rain on a Tin Roof, which is just as fun and makes me just as happy. An awesome plaid pattern finish and no headache of measuring! Thank you, Jenna!! 27. Another fun makeover, this one is brought to you by Morgan from Charleston Crafted. 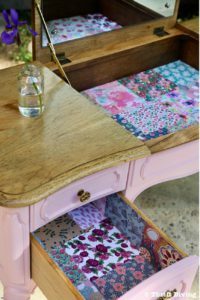 Morgan turns this old sewing table into a fun pop up bar that is just absolutely beautiful! 28. 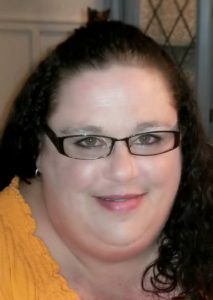 Last but not least, and normally I don’t do this but I just love how it came out, is one of my very own makeovers. 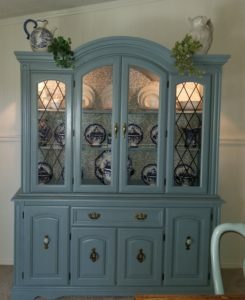 Big Blue was made over with latex paint of all things and decoupage, but to have gotten the china cabinet for nothing, I couldn’t have been happier with how it came out! 29. And yes, a final one from me. This old rocker was a sad little thing when I got her, but I love the finished product! Last but certainly not least, Carrie from Thirty Eighth Street gets the last mention. 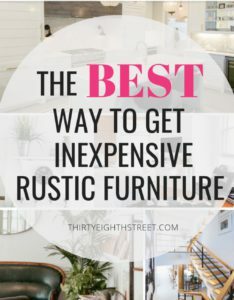 Now this isn’t a finish, but I included it because it is something every furniture flipper should know…how to buy rustic furniture to flip! And that’s it folks. 29 great finishes and tips to inspire you to go make something beautiful! So go get those brushes and paints and make something you like into something you love. Come back and drop some pics in the comments and show me what you create! Beautiful makeovers! 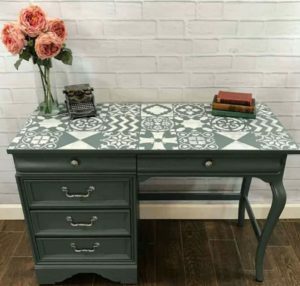 Thank you Tina for featuring my night table and desk. Have a great week! It was absolutely my pleasure! They both came out beautifully. OMG that nightstand though! I love the natural look! Amazing talent!